National-Socialist Worldview: "The Bohemian Corporal"
"The Marshal and the Corporal. Struggle with us for peace and equal rights." Hitler was occasionally called "the Corporal" ("der Gefreite") not as a put-down but as a reference to his valor in the First World War. The nickname "Corporal" was worn as a badge of honor. 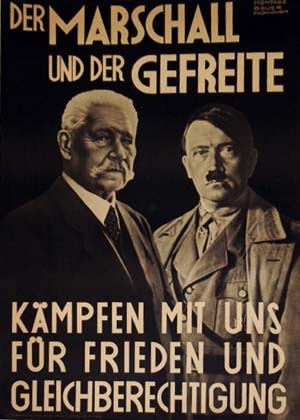 Here we see it used in a pro-Hitler campaign poster from 1932, a context where the working-class connotation also seems to be exploited. Frequently I have been engaged in arguments with a person who seems to have an unquenchable and petty animosity toward Adolf Hitler, to the point that he has difficulty according credit to Hitler even for little things. One of the issues that arose recently was the question of the highest rank that Hitler achieved, whether in the Bavarian Army during the war or in the Reichswehr after the war. During the First World War, Hitler's highest rank was corporal. When offered a promotion to sergeant, which would have reduced his personal risk-taking, he refused. Almost all discussions of Hitler's military record that one can find are explicitly limited to his "war record"; consequently it is difficult to find references to his post-war rank in the Reichswehr, when risk-taking was no longer an issue. The fact that Churchill and some other people called Hitler a "Bohemian Corporal" doesn't make it so. Supposedly Hindenburg and some Wehrmacht officers had called him that, but whoever called Hitler "the Bohemian Corporal" wasn't trying to be strictly accurate. For one thing, Hitler wasn't Bohemian; his native dialect was Lower-Bavarian, and he had served in the Bavarian Army. It seems unlikely that the epithet "Bohemian Corporal" was meant as a put-down. At least, not the corporal part of it. Napoleon Bonaparte was known as "the Little Corporal" all his life even though that was not the highest rank he achieved, and it was not an insult but a mark of the bravery that he had shown as a corporal. Hitler was also distinguished as a brave soldier, even to the extent of refusing a promotion that would have reduced his personal risk. Hitler himself in wartime preferred to be a corporal, so why would it be a put-down? Perhaps the Germans who called Hitler der boehmische Gefreite, like the French who called Napoleon le petit caporal, were alluding to his personal bravery, or likening him to Napoleon. Beaulieu, the Austrian commander, withdrew beyond the Adda River. There was no way to get at him but to cross the river by the bridge of Lodi, a bridge 350 feet long and swept on the other side by cannon. To cross it in the face of a raking fire was necessary but was well-nigh impossible. Bonaparte ordered his grenadiers forward. Halfway over they were mowed down by the Austrian fire of Lodi and began to recoil. Bonaparte and other generals rushed to the head of the columns, risked their lives, inspired their men, and the result was that they got across in the very teeth of the murderous fire and seized the Austrian batteries. "Of all the actions in which the soldiers under my command have been engaged," reported Bonaparte to the Directory, "none has equaled the tremendous passage of the bridge of Lodi." From that day Bonaparte was the idol of his soldiers. He had shown reckless courage, contempt of death. Thenceforth they called him affectionately "The Little Corporal." He was made a corporal at Lodi; and the surname of " Le Petit Caporal," thence acquired, was long remembered in the army. When, in 1815, he was met by the battalion sent against him from the fortress of Grenoble, the soldiers, the moment they saw him, exclaimed, "Long live our little corporal! we will never oppose him." Nor did this fearful passage produce a less powerful impression on the mind of the general. "The 13th Vendemiaire, and the victory of Montenotte," said Napoleon, "did not induce me to believe myself a superior character. It was after the passage of Lodi that the idea shot across my mind, that I might become a decisive actor on the political theatre. Then arose, for the first time, the spark of great ambition." I find that many German books contain references to Hitler as der kleine Gefreite (des Weltkrieges), which is exactly Napoleon's nickname translated into German. I suppose that Hitler was originally called by Napoleon's nickname, then boehmischer Gefreiter, perhaps due to the fact that Hitler did not have Napoleon's small stature. Adolf Hitler, as a painter and drifter, was a Bohemian in the loose sense of the word, in the sense of somebody who lives a "Bohemian lifestyle." The word corporal perhaps also was being used with something other than its primary denotation, to mean an ambitious leader who had the fearlessness of Napoleon. It's quite a colorful description and not necessarily derogatory if that is how it was meant. Hitler consummated the comparison between himself and France's "Corporal" by having troops parade past (not through) the Arc de Triomphe, which commemorates Napoleon's victories over the Germans. (There was a sense of What goes around comes around in that parade that historically myopic Americans usually miss.) With this, Germany gave her answer to Napoleon and history was coming full-circle. 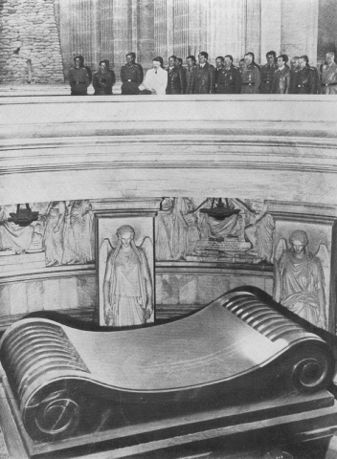 Adolf Hitler visits the Tomb of Napoleon in June 1940. Six months later Hitler had the remains of Napoleon's son, the short-lived Duke of Reichstadt, called by Napoleon "l'Aiglon," relocated from Vienna to Paris as a "symbol of good will and hope for eternal peace." The term bohemian is pejorative enough. You would have to demonstrate that it's pejorative. I don't see it. HEIL HITLER! 4TH REICH, THE RETURN OF THE GREAT ARYAN MIGHT! JOIN ME BROTHERS AND SISTERS, WE SHALL OVERCOME THIS WORLD FULL OF INBRED POLLUTION AND GAIN A NEW EARTH FREE OF THOSE WHO WOULD SEE US DESTROYED! SEIG HEIL! SEIG HEIL! Hadding your Hitler up date has generated no amazing insights. BTW last week I was standing on the site of the Fuhrerbunker , a fitting memorial to the man. As far as being a "Pigheaded Hitler Hater" I would differ from you - I just have more complete awareness of the man's contribution to the welfare of mankind. I have not been trying to offer amazing insights, James Stewart. I try to keep everything so far as possible self-evident. For example, the major documents that are supposed to prove the Holocaust clearly do not come close to proving any such thing, as anybody could see who read them without preconception. It's common sense, not amazement, that I try to invoke. The extent to which Hitler was being compared to Napoleon was certainly news to me, if not amazing. I only learned it in my research for this blog. It's the persistence of the demonology of Adolf Hitler and National-Socialism that is truly amazing. Hitler is the new Beelzebub for you and your crowd. It's your religion. I might be a little more confident in your claim of knowledge about Adolf Hitler if you could at least spell Fuehrerbunker. You don't even know German, and you are not careful about what you write, even in English, as anybody might notice by perusing your posts on ThePhora. I'd have been more impressed if you'd found something positive to say. Then I'd have been forced to countenance some magnanimity and objectivity in you. As it is I already had you pegged as a petty nitpicker; so, no surprise. Hitler was never promoted to sergeant. In the Bavarian Army, rank was not something that one accepted or refused. The very idea is downright laughable. Imagine my general calling me in to tell me: "ahrumph, aspirant officer Falcão de Campos, I' vê been considering promoting you to second lieutnant, what says you. Gee thanks, general, but my shoulder straps and gala uniform insígnia are quite knew, só I'd rather the promotion be postponed until the time comes when my wardrobe needs a major upgrade". Do you really think the military works like that? Truth is, Adolf should have been made an NCO considering lenght of ser vice, but was found by his commanding officer lacking in the skills and qualities required to warrant promotion.